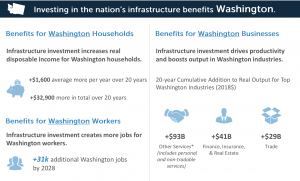 A new study from the Business Roundtable details how investing in essential public infrastructure produces positive economic outcomes. …Business Roundtable – an association of CEOs of America’s leading companies – released a new economic analysis that shows a significant reinvestment in U.S. public infrastructure systems would create 31,000 additional new jobs over the next decade and add $1,600 in disposable income for the average Washington household every year for 20 years. $29 billion of additional output from trade. As we reported earlier this week, Washington has significant infrastructure deficits. The Business Roundtable report, prepared by the Interindustry Forecasting Project at the University of Maryland, finds a consistent pattern of underinvestment in public infrastructure. A modern infrastructure system is key to unleashing the full productive potential of the U.S. economy. In recent years, however, public-sector investment in infrastructure has not kept pace with the dynamism, innovation and growth elsewhere in the U.S. economy. This study is designed to quantify and make the case for the benefits of taking action to reverse this trend. Using an industry-base macroeconomic model, it estimates the economic impacts of a fiscally responsible investment of $737 billion over 10 years in surface transportation, water and wastewater, aviation, water resources, and water transportation, plus the crucial step of establishing a “new normal” level of public-sector commitment to maintaining American infrastructure.